Make a note - standing desks are here to stay. When you're ready to upgrade to a height-adjustable desk that transforms your workspace instantly, the Health Postures TaskMate Go 6300 is your go-to standing desk converter made simple. Ambidextrous in its design, it's perfect when you feel the fatigue and want to switch things up a bit. Install the HealthPostures TaskMate Go 6300 Desk Converter by clamping onto your existing desk for better sitting and standing postures in an instant. If you only have one monitor, choose the single VESA mount option for your TaskMate Go Desk Converter. For users with two monitors, the dual VESA mount will hold monitors up to 24'' in size. Each mounting bracket features pan, tilt, and swivel adjustability. The laptop tray and VESA mount features a stationary laptop holder on the left-hand side. Attach your monitor to the right-hand side using a standard VESA mount. 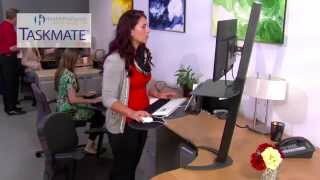 The Health Postures TaskMate Go sit-stand workstation comes with your choice of a standard or large work surface. The standard work surface is only available with the standard keyboard tray, while the large work surface can be ordered with either a standard or large keyboard tray. Adding a larger work surface won't change the footprint of your TaskMate Go, but it will provide you with more usable desk space when you are standing. If you outfit your Health Postures TaskMate Go with a large work surface, then you have the choice of either a standard or large keyboard tray. Each keyboard tray offers tilt adjustment, a rotating mouse pad, a built-in tablet holder, and a padded wrist rest. Great standing desk, it's the first commercially sold standing desk I have bought and I'm 99% satisfied with it. The only thing I would of liked more with the product is an adjustable height for the keyboard being separate from the actual monitors. Both are linked together. When I swap from a standing to a sitting position ( which takes about 10 seconds ), the monitors are either too high or the keyboard is too high. Since I spend 90% of my time standing, this is not a big issue but it could be better! Awesome product! stable, doesn't wiggle when you type, easy to setup on any existing desk! ( 3 months experience with it, have been using standing desks for a year now ). $484.00 List Price: $511.00* The list price is the same as the MSRP (Manufacturer's Suggested Retail Price). It may not necessarily be the price at which the product is sold.